John Batterson Stetson was born in East Orange, New Jersey in 1830. His father, Stephen Stetson, was a successful hatter and taught his children the hatting trade. John Stetson developed tuberculosis as a young man, and headed west to St. Joseph, Missouri, hoping to recover. He was rejected when he attempted to join the Union Army in the early 1860s, due to poor health; and began working as part owner of a brickyard. When the river flooded and washed this business away, he joined a group headed west seeking their fortunes mining for gold. One year searching for gold was enough for Stetson; and in 1865, he returned to Philadelphia to try his hand at the hat manufacturing trade. 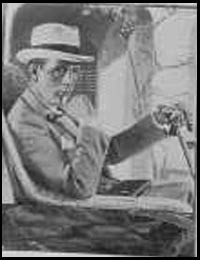 Stetson rented a small room at Seventh and Callowhill Streets, purchased tools and fur, and took on two workers. With the Eastern hat market difficult, Stetson turned his attention to the Westerners. Extending his credit, he made a western hat for each Southwestern dealer in the Boss of the Plains style he had invented during his trek west. Western hats offered by Stetson from 1870 to 1900 included the Boss of the Plains, Alaska, Columbia, Dakota, and Railroad styles. He had made the right choice, and by 1872, he was also marketing his dress hats in his own catalog. As the twentieth century began, he had the world's largest hat factory, with 25 buildings. Although John Stetson died in 1906, his company continued to prosper. Stetson followed men's fashions into the twentieth century, manufacturing the top hat, bowler, homburg, fedora, and trilby. Stetson also began manufacture of straw hats in both western and dress styles, including the Stetson Premier Panama straw. Men's hats didn't change much during World War II years. By the early 1950s, there were fewer dress hat wearers, and Stetson has since focused primarily on their western hats. Pop music symbols are responsible for some resurgence in dress hats, and movies brought back another fedora with Harrison Ford as the swashbuckling archaeologist Indiana Jones.